I have come across both responses many times. But what strikes me is that most people haven’t thought very deeply about the issue. What they are usually expressing is a gut-level response; a knee-jerk reaction. Sometimes they have a sound-bite length reason for their opinion that they have heard from a respected Christian leader which they repeat whenever the topic is raised. The purpose of this short series of posts is to weigh up what the Bible says about how Christians should approach Halloween. Yes – the Bible addresses the issues relating to Halloween, and perhaps not in the way that you expect! My goal is that this would be more than a mere opinion piece on Halloween and would get to the root of what God says about it. Over time I’ve heard many competing stories about where Halloween came from. There are several reasons for this. First, people tend to emphasise the Halloween background story that fits their opinion of the event. If you think Halloween is evil, tell that story. If you think its just a sugar-binge, tell that story. I think we need to try to have a more holistic perspective than that. Second, the history of Halloween is complicated. A lot of our information on Halloween is from obscure sources that don’t tell us all that we want to know. We have to rely on lots of anecdotes from different places over a long period of time. It can be hard to know how to ‘connect the dots’ in a historically responsible way. After all, we are talking about a range of cultural events, in many different places, practiced by many different people, who had many different beliefs, over more than 1600 years. Jack’o’lanterns, trick-or-treat, and wearing scary costumes didn’t all arise together at once. Each has its own story of cultural evolution. Worse, some historians have tried to make the story of Halloween straightforward and sensational to the people buying their books by (quite frankly) making stuff up, or by presenting theories as facts. Some scholarly myths invented over 100 years ago are often still repeated today. It can be hard to get to the bottom of all of this. With all that said, the following series of stages of Halloween development give a basic sense of how we got to today – at least as best as I can tell! Halloween’s roots are generally traced to Scotland and Ireland. The ancient Celts believed in an otherworld where the dead dwelt along with fairies and various other supernatural things. They believed that once per year the membrane between the otherworld and this world opened up so that the inhabitants of the otherworld – lost relatives and supernatural beings alike – could wander in among us. (If you’ve seen the Netflix show Stranger Things that has a similar idea, except the Celtic version opens once per year). At some point it seems that these beliefs developed into putting on masks and costumes to stop the evil spirits from recognising you or perhaps to scare them away. This annual supernatural event was believed to occur on the 31st of October, an evening called “Samhain” (pronounced ‘sow-in’). This was the end of the harvest season and effectively their New Year’s Eve. On May 13, 608 AD the Emperor of Rome introduced the Festival of All Saints (“All Saints Day”) for remembrance of deceased Christians. How does a May 13th festival relate to October 31st? Well, in 835 AD, Louis the Pious made All Saints Day an official occasion for the entire Empire and moved it to November 1. There are lots of possible reasons for this. There was the natural appeal of holding festivals at the end of harvest when people had time for celebration and thanksgiving. However, it also meant that this ‘Christian’ holiday now lined up with the pagan one. This can be viewed as a sensible mission strategy. What do you do with Celts-turned-Christians who like having a harvest celebration on October 31st? Replace it with a Christian harvest celebration of course! It can be compared to how the date of Christmas was established. December 25th isn’t Jesus’ birthday. It appears to have once been a Roman pagan festival day. But when the Empire formally adopted Christianity it made sense to turn pagan holidays into Christian holidays that celebrate and teach Christian truths rather than pagan ones. Christians sought to make all the festivals that marked out the rhythms and seasons of their lives reflect Christian truths. So, harvest celebrations became Christian remembrances for those who have died in Christ rather than an evening on which a supernatural portal to the otherworld opens. Makes sense to me. The Evening before “All Saints Day” was thus “All Saints Eve”, or “All Hallows Eve”. Picture a Scottish man slurring “holy evening” (perhaps with some drink in him) and it’s easy to see how this became shortened to “Hallowe’en”. Notice: the term “Hallowe’en” is from Christian rather than Pagan cultural background. People are messy, cultures are messy, and it is far easier to breed superstition than it is help people understand the Bible. Medieval people understood the significance of these occasions in lots of different ways, some of them quite outrageous from a biblical perspective. All Soul’s Day soon became associated with some of the worst theological ideas of the era. It fit rather well with the medieval doctrine of Purgatory: the belief that there are souls in a place of punishment paying off the remaining penalty due for their sins before they move on to heaven. Thus, All Soul’s Day became a day for praying for the dead to contribute to their swift release from purgatory. So much for the idea that Jesus’ sacrifice takes away all our sins! A surprising early precedent for ‘trick-or-treat’ can be seen in the practice of poor people begging for food from door-to-door in exchange for praying for the household’s relatives in purgatory. Then there was also the intersection between pagan customs and Christian ones. Was Halloween an opportunity for Christians to dress up in costumes to mock pagan ideas about the dead? Or did they do this to join in pagan practices? There are probably examples of both. There are certainly lots of examples of blending the two together. What is clear is that by the time of the Reformation, a lot of people had combined Christian and pagan ideas into an ugly, hybrid of superstitious beliefs and practices. This is a big part of why it’s hard to generalise about where Halloween came from. Halloween doesn’t commemorate a clear historical event, person, or idea that is valued by a particular religious or national group (as is the case, for example, with Christmas and American Independence Day). Halloween is a cultural Frankenstein’s monster: a mess of decaying cultural customs and half-remembered ideas sewn together in different combinations. Much of it is superstitious nonsense and some of it is good, but there is idolatry and demonic deception mixed into it too. 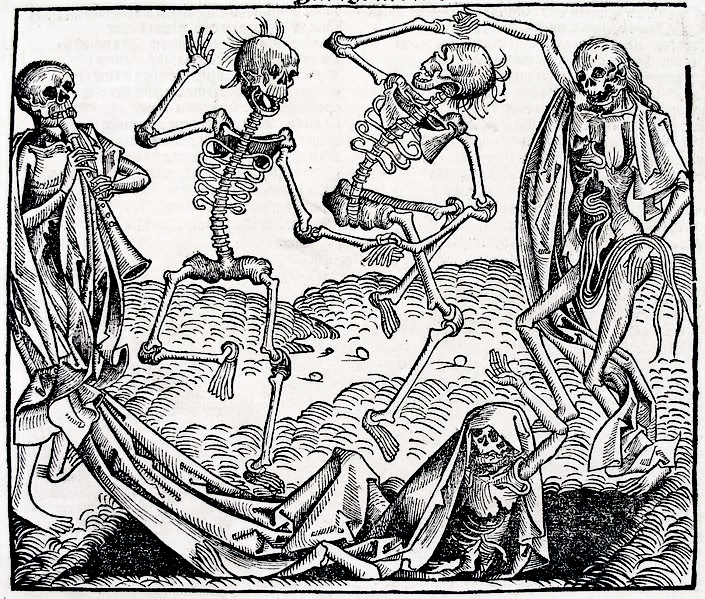 By the sixteenth century we can begin to speak of ‘Halloween’ by that label. 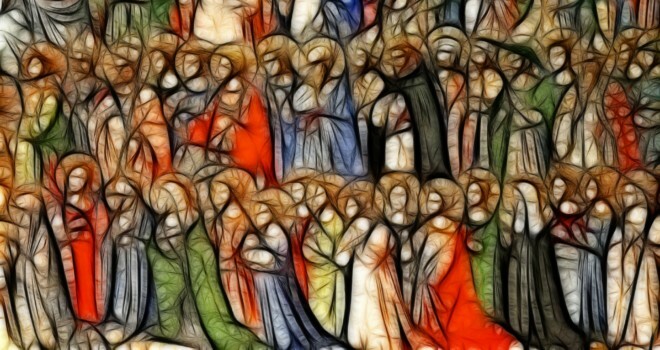 Most Protestants came to reject the holiday because its connection to Roman Catholic teachings (such as purgatory) rather than because of any pagan background. 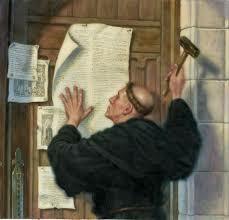 Today many Protestants celebrate Reformation Day instead of Halloween since the October 31st is also when Martin Luther nailed his 95 Theses to the Wittenberg church door. He intended to begin an academic argument about the sale of ‘indulgences’ (i.e. time off purgatory), but it proved to be the beginning of a Europe-wide church reform movement. The Protestant Reformation is rightly remembered and treasured by all Christians who value true, biblical Christian beliefs. In the meantime Halloween persisted, particularly in northern England, Scotland, Ireland, and Wales. It continued to consist of festivities, games, and pranks, interlaced with superstition and paganism. Early American immigration was dominated by Puritans who rejected Halloween. However, in the 1800s many Scottish and Irish people immigrated there and brought their Halloween traditions with them. Most of what we recognise as Halloween developed from these immigrants-turned-Americans. What that looks like is familiar enough: candy, costumes, and tacky decorations. America can turn anything into an opportunity for commerce! Whilst ‘tricks’ were long a part of Halloween traditions, sugary ‘treats’ only took off when sugar rationing ended after World War II. 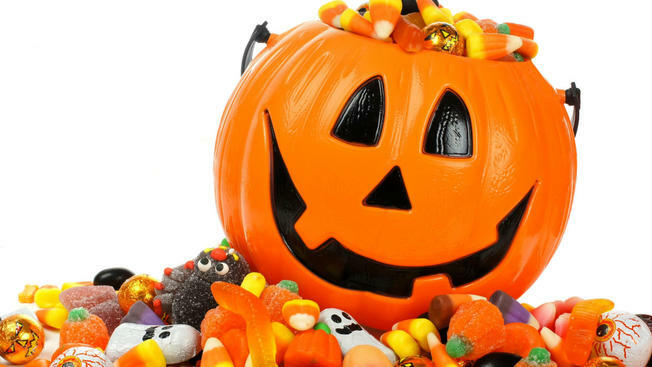 Today about a quarter of American confectionery is sold for Halloween. It is the second-highest grossing American holiday after Christmas. In the last decade we have even seen Halloween grow in popularity in Australia. This version of Halloween is a long-way from both Samhain and All Saints Day. I suspect that most modern, secular Australians have little interest in either custom. But some do. So how should Christians respond? Is Halloween evil? 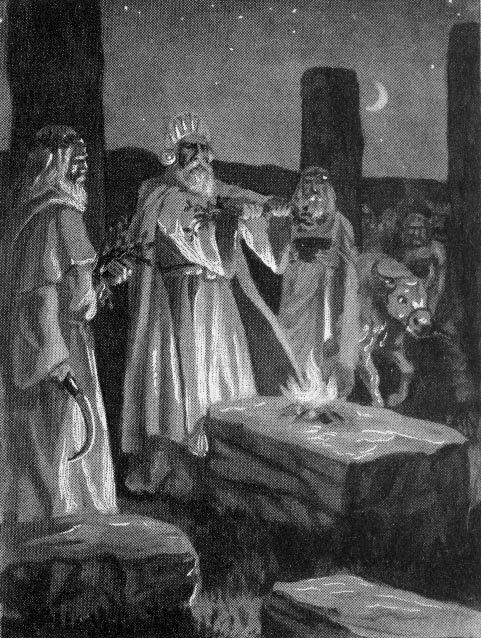 Do its historical connections to paganism and demonic practices make it something Christians should urgently reject? Does its present observance as a religious festival by wiccans, witches, neopagans, and druids mean that we should have nothing to do with it? You might be surprised to hear that the Bible speaks quite directly to these questions. We’ll turn to that in our next post.